This morning the space shuttle Endeavour departed Kennedy Space Center for the final time. Carried on the back of NASA 905, one of NASA's two 747 jets specially modified for the purpose, Endeavour will travel to Los Angeles by way of Ellington Airfield in Houston, Biggs Army Air Field in El Paso, Edwards Air Force Base north of Los Angeles, and finally Los Angeles International Airport. I'll be heading to Edwards on Thursday to see NASA 905 and Endeavour land, and will be there bright and early Friday morning to see them off again. So, ironically, my first experience seeing a Shuttle in person will be the last time one ever takes off. I'm told by many space fans that there was absolutely nothing to compare to a Shuttle launch, and I'm sorry I never had that experience. But I'm glad I'll at least get to see the ship in the sky before she comes to her permanent home here in Exposition Park. I'm delighted that Endeavour is coming here; NASA made a great choice in the California Science Center. It's a good museum with fun exhibits and a decent space collection but its best feature is that admission to the permanent exhibits is free. The ship won't be hidden away; anyone, no matter how poor -- and there are a lot of struggling people living in the area for miles around Exposition Park, at the center of the sprawling yet dense sea of humanity that is the Los Angeles metropolitan area -- anyone will be able to see Endeavour mounted nose skyward complete with replica SRBs and external fuel tank and let the ship carry their imaginations away. What will the schoolkids on field trips think? Will they imagine piloting a space ship? Will they wonder what's next? Will it occur to them that maybe they could design, build, or pilot the next thing that'll take us off of Earth? Endeavour's mission in space has come to an end, but this morning she's embarked on a different but no less important mission of inspiring children to dream of a future in space, and of inspiring parents to dream the same thing for their children. 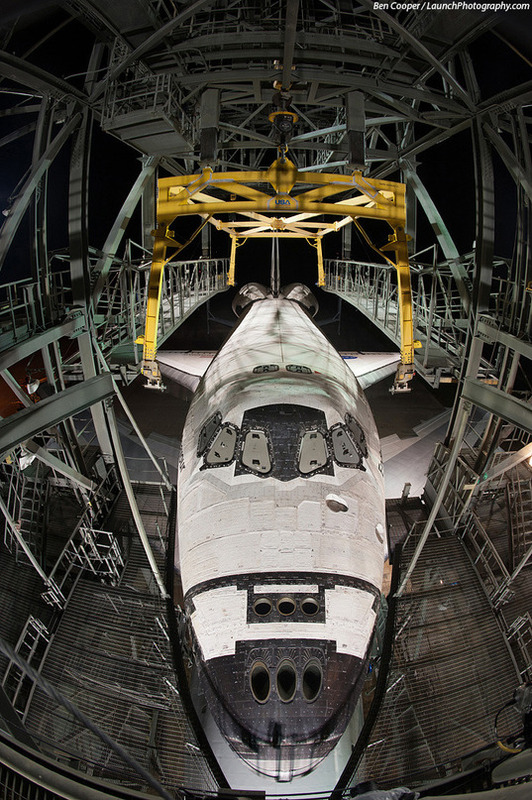 Ben Cooper took some great photos of the Shuttle being loaded onto NASA 905 for the last time. Here's one, which makes the ship look, to me, like a dragon. I'll be watching this Flickr group for great pictures along the flight, and the #spottheshuttle hashtag on Twitter. A fisheye camera mounted atop the ten-story Mate-Demate Device (MDD) captured the three-day process of lifting the 100-ton orbiter Endeavour and placing it atop the 747 Shuttle Carrier Aircraft. This is one image from that series.